When Eli was still small enough to fit in my lap…or maybe my lap was big enough to fit him…we began a family tradition. Up to that point, bedtime was mommy or daddy squishing their way into his toddler bed with him for cuddles, stories and songs. Once the light was off, he curled into the crook of our arm. Sometimes we’d fall asleep with him, others we’d fall asleep first. As our family grew, we were unable to keep up with our nightly ritual. And it began to take a toll on Elijah. He needed those moment of connection with us. Our days were full of school, chores, and taking care of brother and sister. Quite a change from him being the one-and-only. Tuesday nights became Elijah’s night to share our bed. Once again he enjoyed stories, games and songs; a special time ending with falling asleep in a parent’s arms. I’ve noticed a change in our special nights. It’s not always convenient for us to fall asleep with him at 9 PM. Josh and I might not have had an opportunity to talk over the day. There could be a recorded show to watch or friends to catch up with. So he falls asleep on his own. The stories are still there, the games get played and the songs are sung. It’s only that last part that isn’t always realized. How often have I taken time that once was special as a source of connection with God, and instead allowed it to become a routine task? Too often is my answer for myself…This is such a good analogy of what we do with God. Thank you for sharing! Thanks, April. :) So, how have you combated that? What kinds of things have you done to keep your quiet times & prayer times from becoming routine? I actually write out my prayers. I stay more focused by writing and it helps me stay on track. Definitely. We get into routines and God has to shake us. I don’t always like it at the moment, but I’m always thankful that He finds a way to draw me back again. Thanks Melissa. Do you find that the way He draws you back is always through a trial or crisis, or can it be from times of blessing and prosperity? I think really it depends on ‘how far’ I’ve wandered, if that makes sense. If I pay attention at the first sign of trouble or compromise, I can get back in step. If I wait or ignore Him, then I inevitably face some kind of shaking consequences. The times of blessing don’t necessarily shake me (at least that’s my experience), but that doesn’t mean He’s not still blessing me even when I’m not as close as I should be. It’s like disciplining children. :) Haha! i am in one of those seasons where I am oohhhh so close to that intimacy but barely touching the hem of his garment. That is a far cry from several weeks ago when it was all but non-existent. I have once again tried to make it a priority before the computer, before the Y, before life begins. :) Thanks for the reminder Melissa. What a great testimony! :) Thanks for sharing that, Bill. The picture is amazing. Seriously amazing. And I think you really make an excellent point. It’s one of my favorite pictures from when Eli was little! :) It’s strange to look at it and realize he’s a giant almost 7-year-old boy now. Haha! Thanks, Michael. 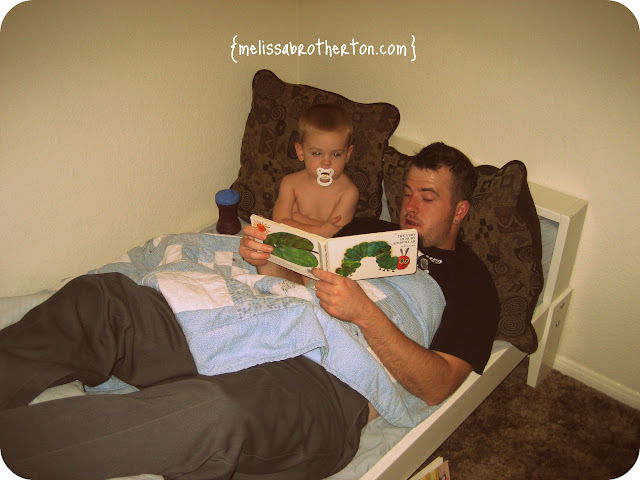 Melissa, in just a short week your blog has become on of my favorites – love this post! ;) Thanks for posting this and for sharing your story too. We do this exact same thing with our little guy (Landon, he’s 2). We have our little nightly routine and I know once we have another child it’ll make that a little more difficult to do. We always want him to know he’s special to us and worth our time, but it’s sure difficult too when you and your spouse just need to crash. I guess it’s all about finding the proper balance – and remembering that it’s much more than just a “routine”. So many other ways I need to apply that in my life too! Thanks again. It does get hard to set aside that time as you have more children, but that’s also applicable to life. When we start filling our life with other hobbies and activities and responsibilities it also becomes harder to have that time with God. He teaches me so much through my kiddos. I need to write mine out, too. Good thinking! I’ve really been struggling to renew my special dates and times with Jesus. I have hope it will get better though. Wow, 18! I cannot even imagine. I was talking with a friend the other day about her nine year old daughter, and I’m not even ready for that. :) One of the things I’ve really enjoyed as I grew older was going out with my mom for lunch. When Eli was just a baby I’d meet her and we’d get some time, just the two of us, to catch up and connect. I miss that now that I’m living out-of-state. She still makes a point to call me almost every day though, and I love those conversations — even if we talk about nothing important. I think that is something I need to remember with God, too. It’s not necessary to have something important to ask Him or seek Him about. He just wants us to spend time with Him.